The science of Phrenology was originally developed by the German physician Franz Joseph Gall in 1792, giving his scientific discoveries on localized regions of the cerebral cortex where the innate universal faculties resided, the title “Doctrine of the skull”. With his ideas of localization, Gall was the first person to create a theory of localized mental illness, that suggested that the mental conditions could be localized in the brain. The science of Phrenology and of the mind that Gall further developed explores the connection between the dimensions of the skull and personality characteristics organized into a systematic hierarchical classification system. By the 1830’s in America, Orson Squire Fowler developed practical Phrenology by opening the first Phrenology office at 135 Nassau Street in Manhattan where he and his assistants read heads, gave lectures and trained a fleet of bright eyed young Phrenologists. In Victorian literary circles, writers were great fans of Phrenology and found phrenological language useful for describing personality or in dialogue. This Phrenological language can be found in the authorship of Walt Whitman, Edgar Allen Poe, Victor Hugo, Herman Melville and Charles Dickens to mention a few. By 1843 phrenology began to be referred to as pseudoscience. In the following excerpt, Norwegian artist Anne Katrine Senstad provides us with the history and conceptual origins of her site-specific installation, Kinesthesia for Saint Brigid. Senstad’s stunning piece will be on view February 15th, between 5-8pm and finally, as part of thePreternatural Closing Event on Friday February 17th, 5-8pm at St. Brigid’s Centre for the Arts. Anne will give a talk at 6pm on the 17th and artists Andrew Wright, Marie-Jeanne Musiol and Adrian Gollner will also be present to take questions from the audience. 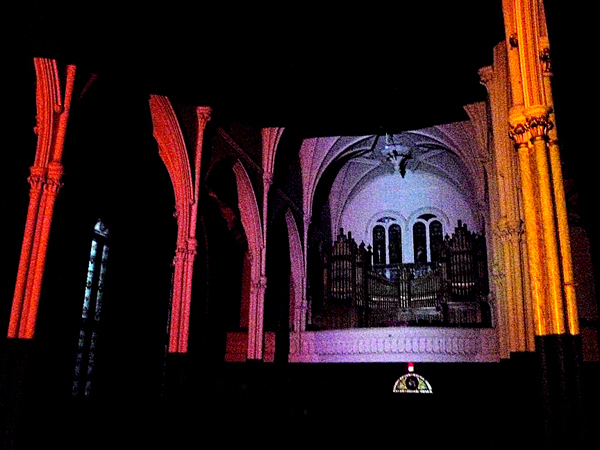 Installation view: Kinesthesia for Saint Brigid, St Brigid’s Center for the Arts, Ottawa, 2011-12. 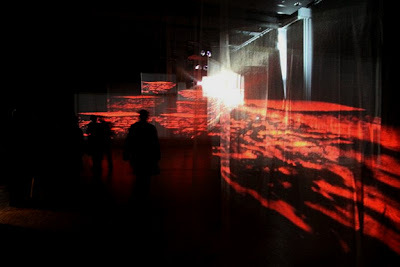 Single projection, video, sound. Music by JG Thirlwell. In dialogue with the deconsecrated church St Brigid’s, the site, sound and time-specific installation Kinesthesia for Saint Brigid creates an environment of projected colors and sound engulfing the church organ, Romanesque columns and vaulting, in the architectural space. The video piece Kinesthesia for Saint Brigid consisting of ever changing colors and the beautifully haunting sound composition by JG Thirlwell, enveloping the interior experience by transformations and references to the transcendental in art; that which cannot be described other than through one’s own experience. 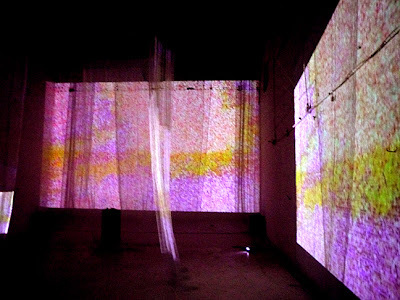 As the title refers to the condition of kinesthesia; the awareness of one’s own movement, we think of the transitional nature of the projected colors onto the space, transforming the space itself into variations of depth, lightness, shapes, a juxtaposition of the sensorial phenomena of light and color – an artificial transformation of space and time. The poetry and polysemy of the site-specific projection brings the viewer into the authenticity of the church’s architecture. We are brought into an experience of the internal, the meditative and physically engulfing visions of pure color and sound. The kinesthesia of this dialogue, a constant movement and transportation of light through space – continues to change the church interior through time and as viewers engage with their presence. In the tradition of minimal light, space and time art, the video and sound projection installation is about creating life in a space by inserting colors, sound and light. 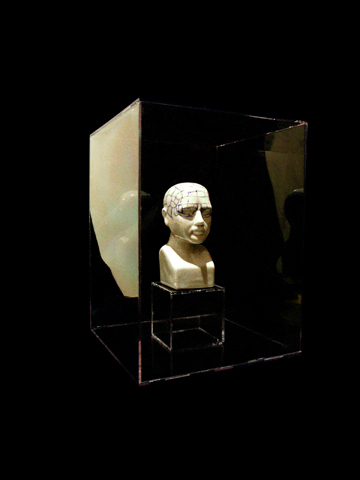 A dissemination through the aesthetics and phenomena of the perceptive and retinal. 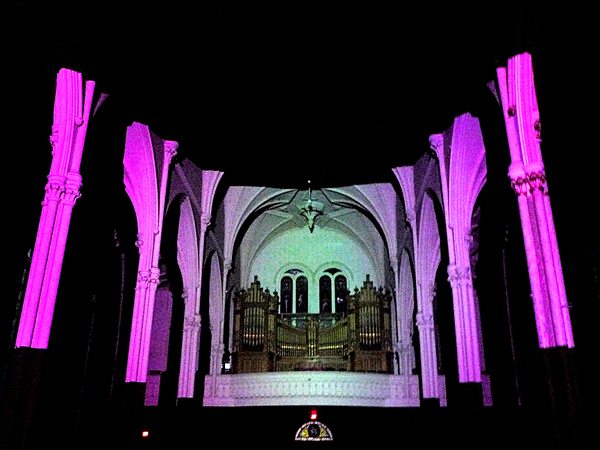 In an attempt to understand and translate the experience of the video projection installation, it can be related to Dan Flavin’s church installation in Italy consisting of fluorescent light tubes in green, pink, gold and ultraviolet, where the statement of creating ‘living space’ in the church and merging with the architecture is key to perceiving the work. Don Giulio Greco, priest of the Red Church (Chiesa Rossa) in Milano wrote to Flavin in May 1996 : “I’d be delighted if someone like you could help us to find an ambiance in our church. By ‘ambiance,’ I mean a living space, a place inhabited by the Word”. 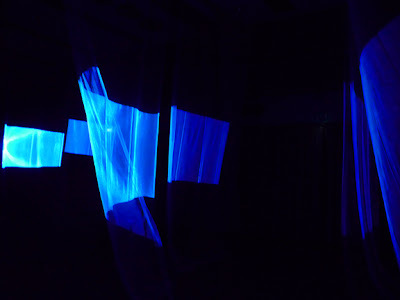 Other early light and space artists that can resonate in language and objective to the video projection installation at St Brigid’s Center for the Arts, are artists such as James Turell, Douglas Wheeler and Robert Irwin amongst others, who relate the sensorial experiences of space with immersive environments, directing the flow of natural light, embedding artificial light within objects or architecture, or by playing with light through the use of transparent, translucent or reflective materials. The transformative is a vehicle to the artwork and perceptive experience. By inserting The Word in Don Giulio Greco’s letter to Flavin, we are reminded of the original usage of the space, here a non-de-consecrated church, a church dedicated to devotion and the spiritual. St Brigid’s center for the Arts is devoted to the arts, be it performance, installation, sound or the visual arts and is a former church, de-consecrated. 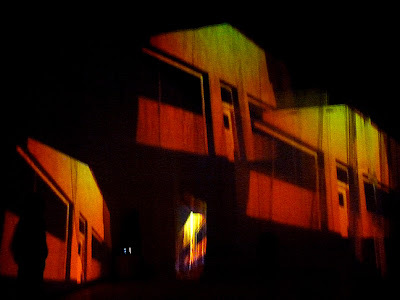 The purity of site-specific work based around color, light and sound in the tradition of the light and space artists, merges the elements of art for art’s sake and restores a sense of experiential states of being; awareness and the perceptive, which is in direct dialogue with the original use of the church. The bridge between historic content, time, and space. Installation view: Kinesthesia in Kvinesdal. Utsikten kunstsenter, Norway. 2011. Multiple projectors, surround sound, wind machine, fabric. Music by JG Thirlwell. Installation view: The Infinity of Colour. ThisIsNotAGallery, Buenos Aires, Argentina. 2011. Multiple projectors, surround sound, fabric. Music by JG Thirlwell.